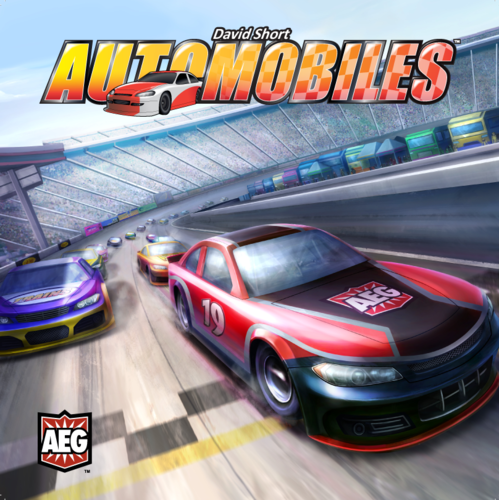 Automobiles is a bag-building racing game. The bag-building mechanic is similar to deck-building except instead of cards, you'll be building your collection with different colored cubes. Each player will have a bag in which they will place and draw their cubes from. Based on the color, the cubes represent various gears in moving your car around the track using improving handling, optimizing your pit crew, and unfortunately, gaining wear. Manage your car effectively and be the first to cross the finish line after 3 laps to be the winner. The game comes with a double-sided board with Grand Prix on one side and Monza on the other. 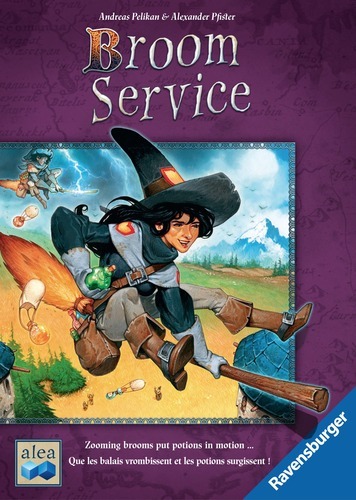 2015 Kennerspiel des Jahres (strategy game of the year) winner, Broom Service is an easy-to-learn fun family game where you zoom around the board on broomsticks gathering roots, herbs, and fruit to deliver to castles. Broom Service is a light strategy game with a clever card play system. 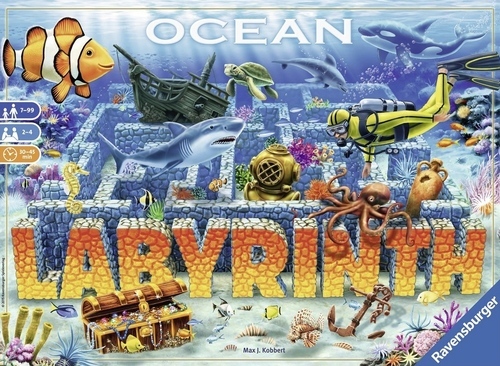 The game board is double-sided adding variety in play. There are two groups of cards - 10 Event cards and 50 Role cards. An Event card is revealed each round and will take effect either before, during, or at the end of the round. Each player will receive 10 Role cards from which their actions will be determined. Each Role card will have 2 options: a "brave" or strong action which has risks and a "coward" or weaker action which has no risks. Play and choose the strong action and risk having that option stolen by an opponent. Choose the weaker but safe option and takes it's ability. Therein lies the heart of the game, balancing when to take risks and when to play it safe. "Have you ever wondered what secrets the Egyptian desert might hold? 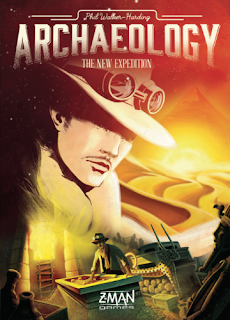 This new edition of Archaeology introduces you to the life of an archaeologist, digging excavation sites in the search of most precious artifacts. Following Phil Walker-Harding's original designs, the talented Atha Kanaani took on the task of creating new, elegant, artworks and illustrations, giving Archaeology a long awaited, modernized look and feel. New artifacts also make their entrance to enrich the already wide range of marketable relics, as well as brand new monuments where to dig them up, such as the Tomb or the Ruins, which bring even more depth to the original mechanics." 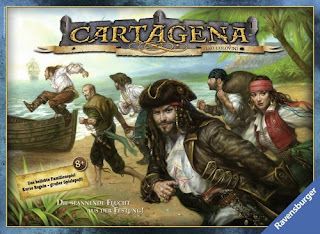 Dig, explore, trade, and sell in this fascinating card game as you attempt to complete and collect valuable artifacts. In this version of Ravensburger's classic Labyrinth game, players dive down into a fantastic underwater world. What underwater routes could you take to reach sea animals and treasures on the shifting ocean floor maze? With the addition of the diving scooter, the pufferfish, and the oxygen tank tiles, game play can take an interesting turn. There are two easy-to-learn game variations. New On Our Shelf Game! Adding to our family games is the pirate-themed game, Cartagena. The game board is comprised of double-sided jungle path tiles that can be configured in a variety of layouts. Each tile depicts various pirate-themed symbols. Players will have a hand of cards that have similar matching symbols from which they will use to move their pirates forward along the path. In order to replenish their hand of cards, players will need to move backwards to a spot with other pirates. This allows that player to draw additional cards from the draw deck. Be the first to get all 5 of your pirates into the get-away boat to win.